You are here: Home / Wild Women of the West / Why Would an 80-Year-Old Woman Move to a Remote Cabin? Stella Walthall Patterson did just that in 1946. 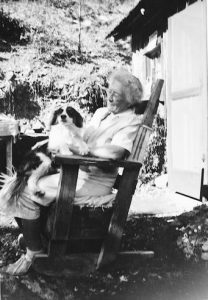 She moved into a remote cabin in the wilds of the Siskiyou Mountains, without electricity or indoor plumbing. She was 80 when someone told her she had “young legs.” Patterson began to consider what she should do with these young legs. Why hang around, she reasoned, waiting to be carried out feet first? Why not have some adventure without anyone saying that she was too old? She moved from San Francisco to a cabin on a mining claim in the mountains overlooking the Klamath River. She brought seeds to plant a garden. She was hoping for a time alone. The very next day, she encountered two young men who lived in a nearby cabin who worked her mining claim. With a sinking feeling, she saw her hopes of being alone were dashed. But the two men turned into good friends, and she shared with them the problems of living in a remote area: shooting a cougar, killing a rattlesnake, surviving the flooding river. When her year was up, she considered returning to San Francisco. Her family pleaded for her to return and promised that they would do many things for her. She realized she wasn’t needed by her family. But the two men needed her, as did one of the men’s recent wife and their new baby. She was needed where she was. We need to be needed by someone. We need to make a difference to others. That can help keep us alive. Patterson died when she was 90, just weeks before her memoir, “Dear Mad’m,” was published by W. W. Norton & Company.